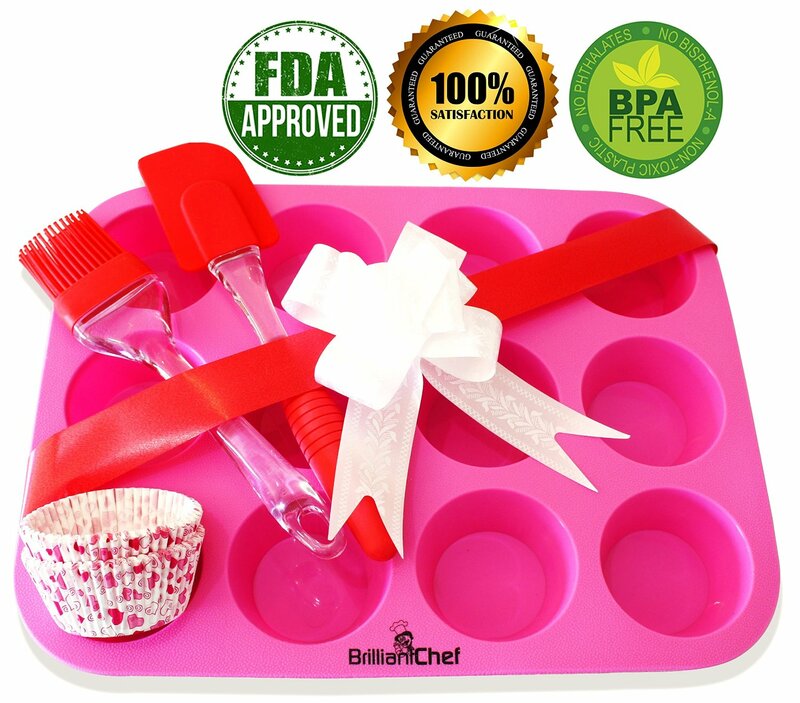 We are baking Valentine's Day cupcakes today with my new Premium 12 Cup Silicone Muffin Pan & Cupcake Baking Pan Complete Bundle. This is such a beautiful set, and includes a 12 cup silicone muffin pan, a silicone spatula, a silicone pastry brush and 50 paper muffin cups. You also get a free muffin Recipe E-book with the set. This muffin/cupcake pan is made of non-stick food grade silicone and is a high quality pan. I have been replacing several of my older metal pans with silicone ones and this one seems sturdier than some of the other silicone cupcake pans I have. I love the pretty pink color of this set too. It really brightens things up. The included silicone utensils are sturdy too, and worked well for making our cupcakes. With 50 of the paper cupcake liners it was easy to make plenty of cupcakes to go around, and the white papers with hearts on them was a beautiful touch for our Valentines treats. So far I have only used these items for cupcakes and muffins, but the included recipes will allow me to try a few new projects for my new pan set. I was thinking of making some pot pie cups in this later on, and have also been looking at a few other recipes from the book. Placing the pan on a cookie sheet makes it easy to put it in and out of the oven without worry of spilling or burning yourself. The pan is nonstick so cupcakes and muffins were easy enough to get out. If you have any trouble, the silicone is flexible enough to press up and help get the muffins out easily. Cleanup is a breeze since these can be hand washed in hot soapy water or placed in the dishwasher. So far everything I have used these for has come out perfectly.